Patel quota agitation leader Hardik Patel, who obtained bail in three cases and is set to walk out free after being in jail for nine months, has claimed he did nothing that could cause law and order problem and invoked the famous phrase ‘Satyamev Jayate’ (truth alone prevails). Extolling the virtue of the phrase in a letter, addressed to Gujarat government, Hardik said, “Satyamev Jayate. This phrase has been the guiding force for Lord Rama and Mahatma Gandhi, and remains so for today’s youth. I have full faith in India’s judiciary. I believe that innocents and poor do get justice. I was thrown in jail even when I am not guilty,” he said. “Let me tell you the truth: only a goat is made to sacrifice, not a lion,” the 22-year-old leader said in the letter, written by him a day after the court granted him bail in two sedition cases on Friday last. “I have never supported violence in any from...Till date, I have never done anything that could cause law and order problem, nor do I intend to do any such thing in the future. I want to be the voice of the state through non-violence and work for the uplift of poor, farmers, youth and women,” he said in the letter which was made public by his lawyer Yashwant Vala today. Claiming that his nine-odd months of jail term has taught him how to “cleanse dirty politics”, he expressed his distrust in political parties like Congress and BJP. “I have spent nine months in my mother’s womb, and another nine months in jail, totaling eighteen months. In this period I understood how to cleanse dirty politics,” he said. Hardik said he comes from a simple farmer’s family and has full faith in judiciary, and the court’s verdict has strengthened his belief that “innocents and poor do get justice”. 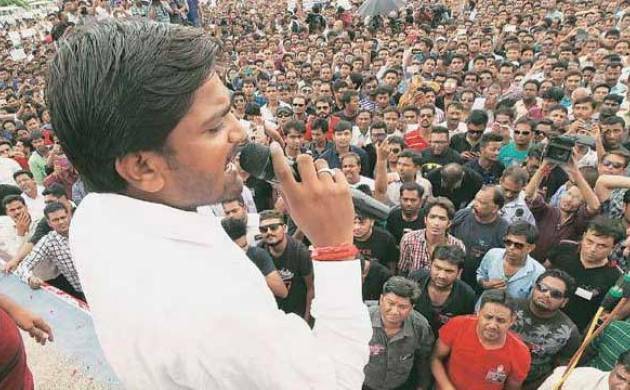 After nine months of incarceration, Hardik is set to walk out of jail as the Gujarat High Court yesterday removed the last hurdle by granting him bail in a case related to violence at Visnagar MLA’s office. However, the Patel quota agitation spearhead will have to stay outside Gujarat for the next six months, as directed by the high court on Friday when it granted him bail in two sedition cases. Hardik was accused of inciting violence to put pressure on the government to accept the demand of OBC reservation for Patels. His mega rally on reservation held in Ahmedabad on August 25 last year had sparked violence, in which, 10 people, including one policeman, were killed and public properties and vehicles damaged across Gujarat.